anyone know anything about this dac? will be picking up one tonight, nothing but outstanding reviews from owners. Cool, you might want to see if you can have on hand some other tubes to roll in it though. Have you heard this dac Tony? i started with upgraded tubes and caps. this 25 lb beast is something special. Do tell more......I'm interested in this too! let's start with the cons. this thing is big and heavy(25+ lbs.) it will take up a shelf by itself and needs breathing room for that tube that sticks out on top. pros. detailed without being harsh, layers of detail in the midrange, which is on the warm side of neutral. there is plenty of tight bass. the speed of the dac is fast. here's the weird thing, you know how some equipment has the soundstage pushed forward toward you, this thing seems to instead pull you in your chair closer to it....strange. i'm not using it in balance mode so i only had to upgrade two tubes and two caps which made the price $1362 going balanced will push the price up more. the great thing about this dac is it's tube rollers dream and now you get to roll caps without having to solder. it woke my system up. Marvin, sometime soon I'll need to come get my ears on it. 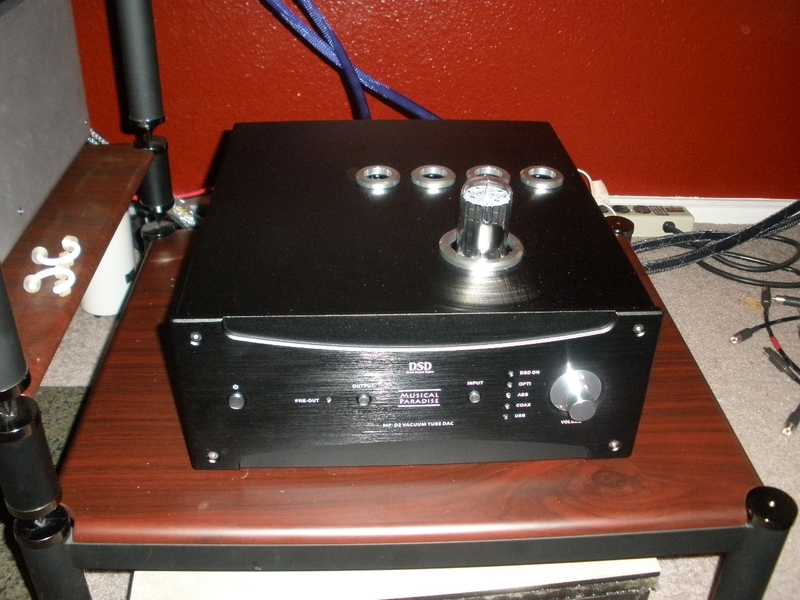 Nice looking dac! So you can change some of the caps out to match the tube? 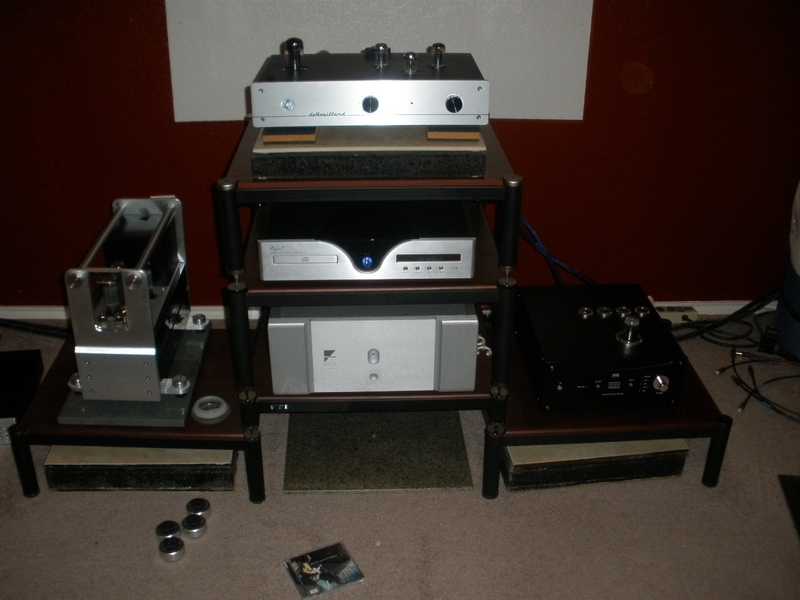 The LH labs vi tube dac has something like that but but at a lot more $$$$$. I haven't done any swapping yet. Do you have to discharge the caps before swapping? They are in the signal path, so no. You're thinking of power supply caps. modwright is now doing mods on the musical paradise dac, I don't know which version or the cost. Hi guys, RE the Musical Paradise DAC, I actually have MP D2 DSD DAC here, with AKM DAC chips, Mundorf coupling caps and USB input. Re-biased tube analog stage (optimized for 6922 driver tubes) and replaced signal path resistors with Tantalums. Revised power supply operating voltage as part of bias revision. Added our own SS High Voltage Regulator circuit to provide rock solid regulated B+ to the tube output stage. Bypassed the B+ and regulator rails with MWI custom capacitors. It sounds MUCH better than stock now! It is actually a well designed and built DAC. In stock form, I found the soundstage to be too diffuse and the tonal balance off. When I looked at operating bias and where the 6922's were operating on the tube curve, I could see that they were operating in a VERY non-linear region. Once this was resolved, alone, things got much better! I then added our own SSHVR (Solid Stage High Voltage Regulator) with MWI bypass and the B+ became VERY clean and VERY tight! This translated to tighter and better defined bass and control across the frequency spectrum. The combination now, of proper operating bias, upgraded tube signal path resistors and regulated supply, gives the music a controlled but natural and organic flow. here's what dan had to say about the mod. I did compare it to an Oppo 205 and I was pleasantly surprised to find the sound with our mods to be on the same level as the modified 205. There are some tonal differences, but the level of sonic performance was right on par! Both mods use the 6922 tube and both are optimized for a similar operating point on the tube curve. I am very pleased and excited with how this turned out! Please contact us if you are interested in learning more. Mod Price: $500 + shipping.